I needed something motivational and inspirational for my studio. It's part of my whole 'making my life happier, anxiety-free and colourful ' resolution. I was thinking along the lines of a clever slogan or insightful quote as that is quite on trend at the moment. I have never been good with words... actually I take that back, I am pretty awesome at making up kids songs on the spot. I even managed to impress my Mister the other day after belting out a tune I pulled from thin air. So if everything else fails I maybe able to get a spot on Playschool. Anyway where was i going with all of this...ahh that's right... 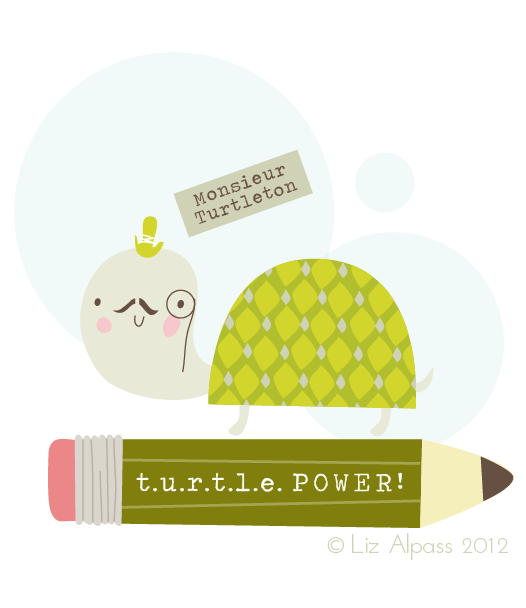 I managed a little print with my little Monsieur Turtleton. Okay so it's not quite insightful but it is FUN! He's so cute!! I love your style!! Oh, he's precious! Love him..and your blog is delightful!! I love him. So very cute. Waaaahhh it's a turtle with a mustache! So cute I'm gonna have a heart attack! LOVE!